Key Difference: Shopping malls or malls are large enclosed spaces that are often characterized with many stores that sell merchandise to the public. Malls can be medium to large in size, depending on the construction and the number of stores that it wants to hold. Outlet store are small stores that sell merchandise directly to the public from the company. These stores often consist of only one or two goods and that to at a discounted price. The term outlet refers to two types of shopping concepts: merchandise purchased from a wholesaler or the manufacturer opens the store. Malls and outlets stores are two different types of shopping stores. Almost everyone knows and has been to a mall, while outlets are not that famous. 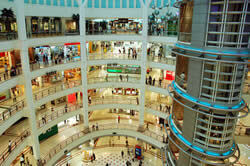 In addition to shopping, malls have become a place to hangout, enjoy, eat out and even visit a amusement park. Though, many people have visited a mall in their lifetime, to differentiate it from other type of shopping stores becomes a tad bit confusing, resulting in using the wrong name at the wrong time. Malls are big buildings that are associated with many stores and additional activities, while outlets are small stores that offer discounts on designer merchandise. Shopping malls or malls are large enclosed spaces that are often characterized with many stores that sell merchandise to the public. These places are also referred to as shopping arcade or shopping precinct. Malls can be medium to large in size, depending on the construction and the number of stores that it wants to hold. Shopping centers usually refer to smaller malls, while shopping malls are used to refer to the large shopping areas. The malls are enclosed and have centralized cooling or heating, depending on the weather and the area where the mall is located. Malls are also car-friendly and are associated with having large parking spaces in an underground parking lot or an adjoining building. The malls also have many different stores that sell many different kinds of merchandise, including food, jewelry, clothes, specialized stores, watches, etc. The concept of the mall has not been a new one; they have been around since Ancient Rome. The concept itself has been acquired from the Trajan's Market that was one of the earliest shopping centers that established in Rome. Rome’s are also known for its many bazaars, which eventually developed to shopping malls. The malls gained popularity around the 1920s, following World War II, when people started shifting to the suburbs from the city. In order to make it easier for the people to shop, many stores were opened in one bigger store that allowed easier access to the various stores in the same place. The malls have a variety of branded and local based stores. The prices of the stores also vary depending on the type of the store; while branded stores are quite pricy; other smaller stores offer normal prices on merchandise. Malls are also associated with having food courts, movie theatres, play area and many other attractions to draw in the public. A few malls, such as the Mall of America in Bloomington, Minnesota, have also housed an amusement park inside to mall itself. Malls are quite large and require a lot of time to try and visit every store. They have elevators, escalators, stairs and walkways to help the public get around from one place to another. There are various different kinds of malls: Neighborhood center, Community center, Regional center, Superregional center, Fashion/specialty center, Power center, Theme/festival center and outlet center. Another feature of the mall is that they cannot conduct sales online, they must have a proper outlet; though they can have their own websites that state upcoming events, the number of stores or a list of the stores they have, etc. Outlet store are small stores that sell merchandise directly to the public from the company. These stores often consist of only one or two goods and that to at a discounted price. Outlet stores are also known as outlet malls, factory outlet and retail outlet. The term outlet refers to two types of shopping concepts: merchandise purchased from a wholesaler or the manufacturer opens the store. In the first concept, the store purchases merchandise from a wholesaler or from the manufacturer in bulk. The purchasing in bulk gives the store some money left over, which it can either keep as profit or pass it on the customers, which is what most happens. In the second concept, the manufacturer, themselves, open a store to get rid of excess production or merchandise that was not sold in the last season. These merchandises are sold for a cheaper price compared to the ones that are sold in department stores or luxury shops. Similarly, the layout and set up of the store varies depending on the type of concept it is. In the first concept, the outlet is opened in a small store in an open mall or a strip mall. There could be more than one outlet stores that are clubbed together in one place; this is known as outlet mall. Outlet malls are generally outlet stores by different companies that opened in an open-air mall. In the second concept, the outlet stores are attached to the factory of the company that is trying to sell their merchandise; these are known as factory outlets. These stores are often very close to the factory of well-known factories. Outlets can sell designer merchandise for cheap as they are either goods from last season, no longer in fashion or they are somehow damaged. The damage may not be that great, or even be that noticeable, but it might have been rejected in the selection process. 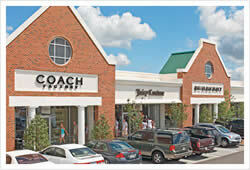 Outlet stores are small and do not have any additional facilities such as food courts, play area, etc. Factory outlets also may or may not car-friendly, depending on the company that started the store. They also may not sell more than one type of merchandise; they can only sell the type of goods that the company produces. Burlington Coat Factory is one of the most popular factory outlets in New York State, which allows regular people to purchase coats at a discounted price.